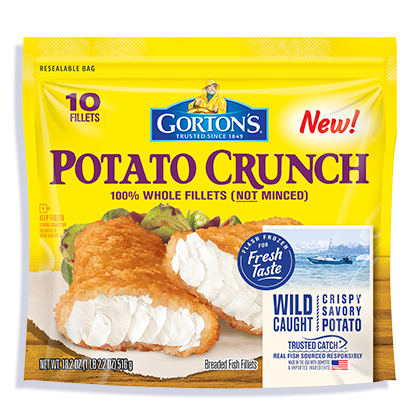 When you combine unbeatably fresh-tasting, wild-caught fish with the irresistible crunch of potato chips, you get our Potato Crunch Fish Fillets. These flaky whole white fillets covered in a crispy potato breading are the flavor adventure your mouth has been craving. 3. Bake 16-18 minutes total*. Flip after 10 minutes. INGREDIENTS: Pollock fillets, breadcrumb coating, vegetable oil. Wheat flour, water, sugar, dehydrated potato (potatoes, mono and diglycerides), corn starch, salt, yeast, whey, maltodextrin, baking powder (baking soda, cream of tartar), natural flavor.